Being stationed in Germany has quite a few perks. Travel, new cuisine, fantastic culture and a serious lack of Fast Food. From the top of my head I can think of about 3-4 locations around my city that serve fast food, unlike back home where it was on every corner. At the same time, I miss Chick-Fil-A. Although, it always seemed that the days I really craved it was on Sundays…go figure. This recipe was dreamed up by a combination of my old diet and now my new one. Pickle-brining chicken was something I used to do in restaurants I worked in, it makes the meat super moist and perfectly seasoned with a hint of dill-pickly yumminess. It also utilized something people normally throw out-pickle juice. I’ve also seen tons of recipes out there for using crushed pork rinds as a zero-carb breading for meats and veggies. I’ve tried it before with mozzarella sticks, and the pork rind flavor was a little too over powering for me. 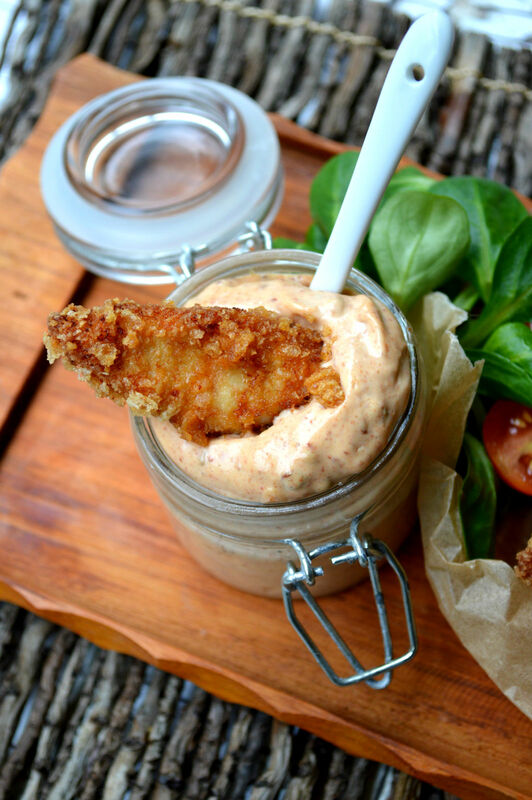 This recipe is perfectly balanced, the pickle flavor masks the pork rind flavor so you are left with a crispy chicken tender very reminiscent of Chick-Fil-A. I’m also paring this with a recipe for Chilpotle Aioli. The hubby likes everything spicy, so I figured this would add to the Chick-Fil-A allure by making it more like a spicy chicken sandwich, but without the bread. I recommend making your own mayonnaise, it’s just THAT much better tasting and you can choose a healthy oil to make it with. But, you can use store-bought as well…especially if you don’t have a few extra egg yolks just lying around. 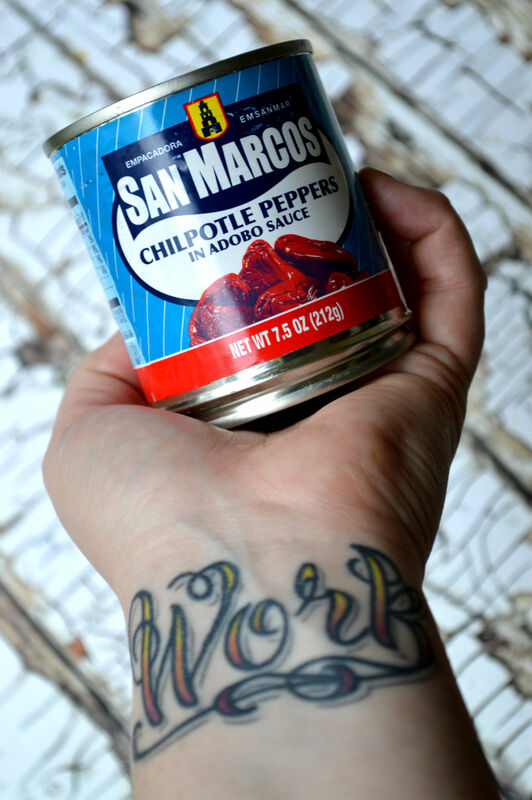 I normally have a jar of these chilpotle peppers in adobo in my pantry. The left overs I usually put in small plastic baggies separatly and freeze them. Then you can thaw as you need them. Almost every grocery store has these in the International section for about a buck or two. After I drained all the pickle juice from my bag of chicken. Crushed pork rinds–the zero carb breading! The final product. Fried to golden brown deliciousness! 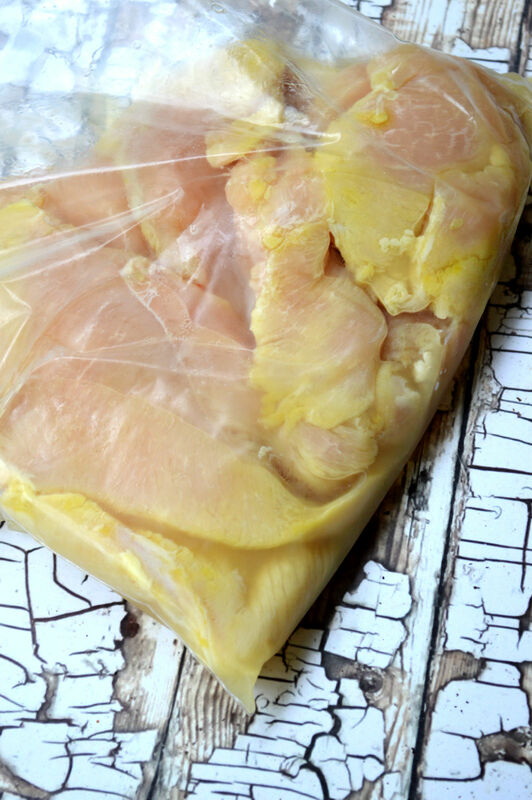 Place chicken breasts and pickle juice in a freezer-sized ziplock bag. Store in fridge overnight to brine. Drain pickle juice from bag. 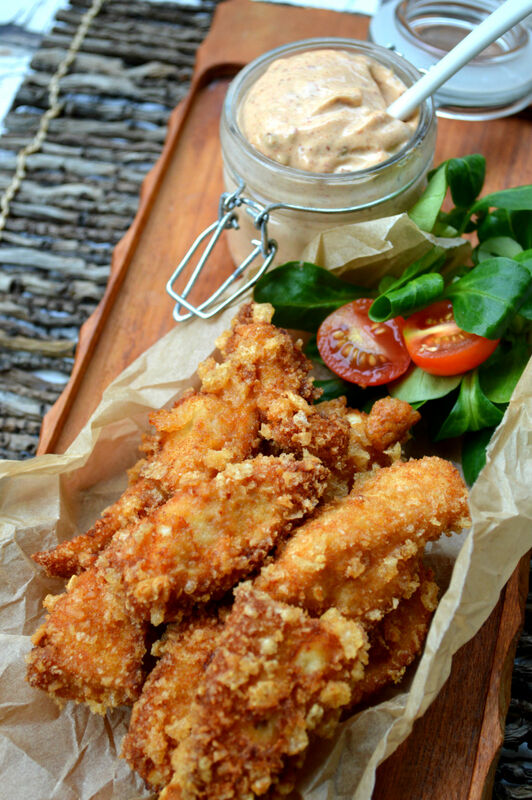 Slice chicken breast into tender or nuggets, whatever you prefer. One at a time, place a strip of chicken in egg wash and then in the bowl of crushed pork rinds. Press down to get the coating to stick-the wetness of the pickle juice on the help the crumbs to stick. Place on a plate until you are ready to fry. In a medium sized fry pan, heat peanut oil over medium-high heat. You don’t need a lot, just enough to cover half the chicken tender. Fry on each size of chicken for 2-3 minutes, until golden brown. 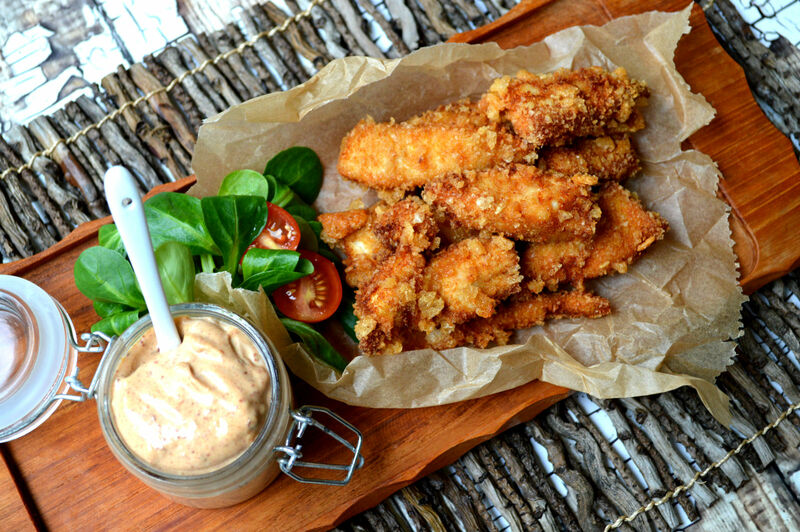 Place chicken tenders cool on a paper towel-lined plate until all are fried. Serve with Chilpotle Aioli *see recipe below. Place mayo, garlic and peppers in a food processor. Blend until fully combined, about 30 seconds. After I pigged out for 2 weeks in USA, the low carb diet is a must starting next week am starting. This is definitely one of the dishes I will be making. Thank you Sarah! I had no idea you can substitute the bread crumbs with pig rinds.. hope I can find it in the store French stores.. It is seriously awesome! and no carbs!!! 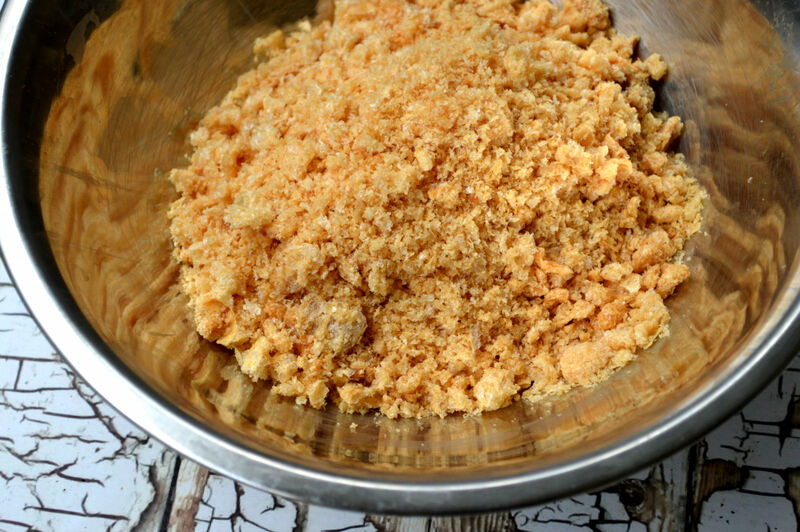 If you mix 1/2 t. of unflavored gelatin with the pork rind crumbs, they stick better. Gelatin forms a bond with whatever protein’s being used. That is awesome! I am totally going to try that! We were also stationed in Germany, for 7 years. Miss the lower cost to eat healthy over there. Oh my god! I know, right? I am going to miss the German Aldi sooo much! Aldi is opening stores throughout the US now. Love their prices! what is the purpose of the pickle juice ? I don’t have some..do you think I could try with the juice from my sauerkraut ? Hi Annie! A basic brine is salted water, which the chicken meat absorbs. So it makes it juicy and seasoned. With the pickle juice it adds a little of that salty-dilly-pickle flavor. If you used sauerkraut juice it would do the same thing, just make it taste like sauerkraut. 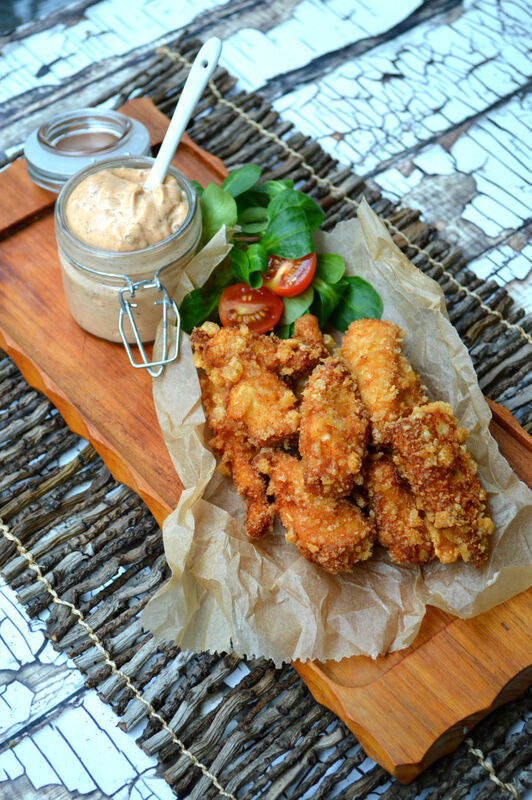 This fried chicken look so ridiculously delicious.. I never have brined anything before so you have definitely have inspired me to try the recipe out! I try to brine all my chicken and pork now that I know a bout it! You can’t brine beef though, just remember that! It turns the meat a cloudy pale pink, blech! Its not soooo bad. Corned Beef and Cabbage is a very awesome dish great for keto. It is a great dish for spring in America when we eat it with Colcanon or Curry on St. Patricks Day. Very inventive. It looks very tasty. Pork rinds= carbless and guilt free. Thank You Sarah! My husband won’t eat pork rinds, what can I use for a substitution? Hmm, the pork rinds make it have zero carbs. Honestly, you don’t taste them at all! Another good low-carb breading is almond flour, but then make sure you dip the chicken in egg to make the crumbs stick! This looks amazing. Do you think it would be good with chicken thighs? I dont see why not! Though, you may have to fry until golden brown and then finish in the oven. Thighs take a lot longer to cook since they have bones in them! Any reason you wouldn’t cut the chicken into strips/nuggets before you brined them? Honestly, Ive never tried it! I was a little afraid they might get too salty, but if you try it please let me know how it turns out! I cut them the other night and then brined them. They turned out amazing! Awesome! I am totally going to start doing that! This was so good! And it did taste like Chik-Fil-A. Better actually. meal was real quick and easy. I love your recipes! Keep putting out more! Ingenious!! Now I won’t throw the pickle juice away any more! omg!! My mouth literally watered just looking at those crispy edges!! Yumm! Hey, any ideas on what I did wrong? I couldn’t get the crumbs to stay on the chicken as I fried it in veggie oil. Tried the unflavored gelatin route and it just came right off. It might have been that your oil wasn’t hot enough/not enough oil? I make these all the time with just chicken and pork rinds and it always sticks! Now that I think about it, I think it was because I used too much oil! Thank you for your help! These sound great. Has anyone tried frying these in an electric fryer? Do you think it would work if I baked instead of fried these? I am a pickle and fried chicken fanatic. Mash them together? Oh man… Happy girl! I will be making these very soon. Thank you!! I just wanted to let you know that I made chicken nuggets using your recipe. They were SO GOOD. Definitely curbed my craving for regular fast food chicken nuggets/strips. Thanks for sharing! Excellent recipe! We were stationed in Berlin, GE years ago, before, during and immediately after the fall of the wall so I can relate to the cravings for stateside food. Can’t wait to make this one myself. I have always made a fried chicken nugget that my family loves. Tonight for my son and myself on keto lifestyle I made your pickle brined chicken. Absolutely the most amazing chicken I have ever made. The rest of the family was a bit jealous. They said from now on that is how I have to make chicken..thank you for this wonderful recipe. Can someone tell me where to buy crushed pork rinds, or do I have to buy the rind and crush myself. I live in Toronto Canada in case that makes a difference. I buy them whole and crush them in a food processor! I live in Calgary and I buy the bags of plain pork rinds at the local grocery store. I like the ones by old dutch best. I live in Alberta and buy Old Dutch Bac’n puffs. Same thing pork rinds just a different name. I’d imagine they sell in Toronto as well its a Canadian product. I work a grave yard shift and I wasn’t able to cook the chicken after them bringing “overnight” (while I slept during the day). I’d like to try them when I get home though. They will have brined for close to 24 hours. Do you think this will affect the flavor/texture? Where did you find pork rinds in Germany? I don’t think I’ve seen them, maybe there’s a German name I don’t know? Thanks! I bought them at the American Commissary! This is a WINNER!!! I never write reviews or comments about recipes but I had to chime in on this one! The pork rind faux breading is delicous and soaking it in pickle juice made it moist and flavorful (and living in Atlanta I can safely say with authority that it does taste like Chik-fil-A). And the sauce is a perfect compliment to the chicken. My husband loved it! Thanks for such a wonderful recipe!! I made this today and it was delicious. You have to do it carefully so the breading stays on. Really good low carb alternative!! 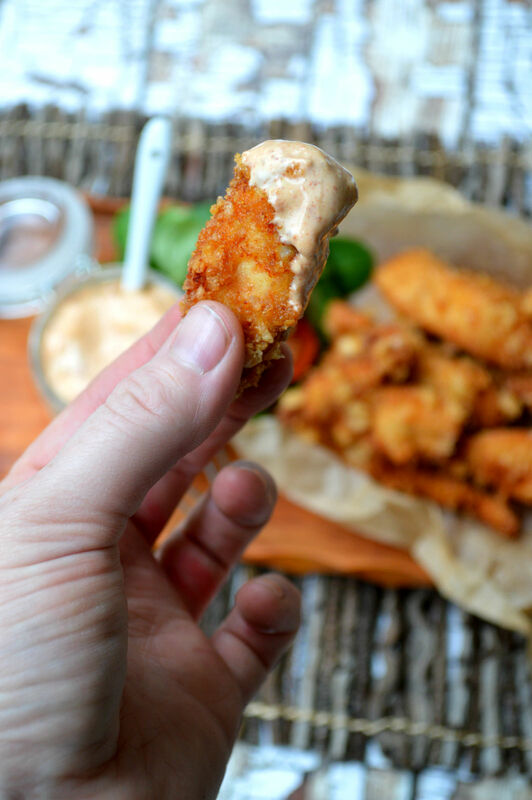 Thought I’d chime in and let you know I made these tonight (with egg/almond flour because I was out of pork rinds) and they were the most delicious chicken strips I’ve ever eaten. I used a soup kettle and deep fried them for about 4 minutes and I must say it was so much easier than I thought it would be as I’ve never deep fried anything before. The pickle brine is just genius; definitely a meal I will make again and again. P.S. I don’t own a food thermometer so I used a popcorn kernel to test the oil readiness (to ensure the breading didn’t just fall off) and it worked like a charm. Place the kernel in the oil before turning on the heat and when the kernel pops it’s ready for the chicken! Thanks for the great recipe! These were good. They fried up crispy and you can’t taste the pork rinds. I highly recommend using a splatter guard on top of your skillet because they popped like crazy for me. I used boneless skinless chicken tenders and i fried them about 3 minutes per side. The chipotle aoli was good as well. Hi. I’m from Australia. These were friggin awesome. Thanks so much! Where did you find pork rinds in Germany? At the Army Military Commissary 🤔 not sure if you could find them in any German stores.